Readers since 2003 will remember the discovery of perhaps the most exciting Knutsen historical photograph ever - the incredible image from the August, 1902 issue of The Cadenza magazine. The original image was less than 3" x 5", and we were able to make out a lot of details, though not nearly as many as we would wish. Cut to early 2008, when an even more incredible discovery was made – not just a significantly better image of the Payne photo, but very possibly the original itself! And what an original! Not a standard cabinet card, but a peculiar composite image measuring some 23" x 14” (not including its original frame). 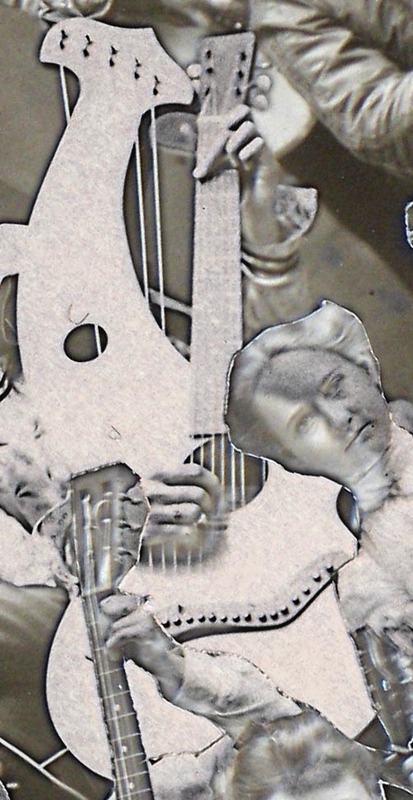 The owner of this prize, Dirk Vandeberg of Guitar Safari in San Pedro, CA had told me that the photo was unusual over the phone, and sure enough - there appeared to be an outline around the heads and instruments, indicating the photograph was in fact four separate images joined together. The photographer had re-used the same small stage and riser to shoot the class in four separate sittings, not one large one. The results were then cut and pasted together. As the very crisp image appeared perfectly flat through the glass, we could not guess at the process used to make this image. Since it was virtually impossible to get a decent photograph through the 100-year-old glass, I convinced Dirk to open the backing and remove the photo. Running our fingers over the joined areas, we were stunned to feel the raised edges of the original four cut and glued-together photographs! This was either the original used to create the Cadenza photo submission, or one of several originals (assuming some dedicated member of the group had volunteered to create more than one of these special images). Bottom line: We now had the best possible master with which to re-do our study of the group members and instruments. Not surprisingly, there were some new findings. 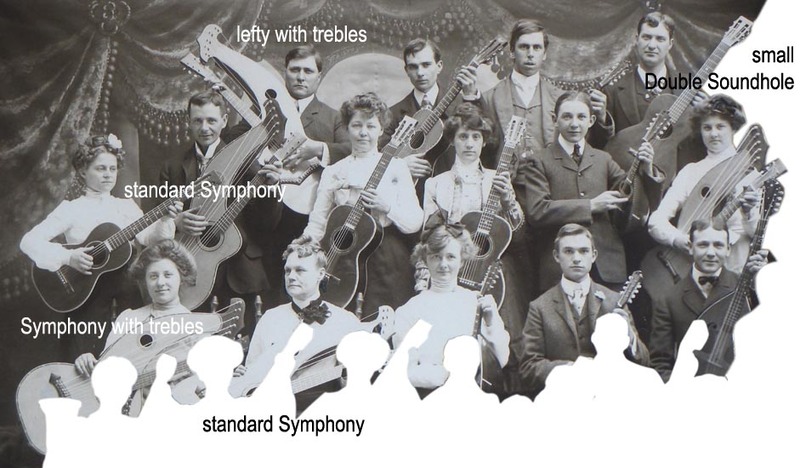 The first task was in identifying and re-counting the 13 Knutsen harp guitars in the composite photo. Since four separate shots were taken, we now realized that the instruments could have been re-used up to four times. Even though the Cadenza caption mentioned 75 simultaneous performers, many of these instruments appear suspiciously similar. After exhaustive analysis by myself and assistant Knutsenologist Darrell Urbien, the results showed that – despite several nearly identical specimens – there are still at least 10 different harp guitar specimens. The small double-soundhole harp guitars in front are indeed different, though the one on the right was used two more times (all but hidden from view in each case, as if they didn’t want to “give the trick away.”). Only one other harp guitar – a standard Symphony model in the upper left quadrant – could not be proven to be unique. With these clearer photos, I was able to add three more specimens to the Archives than I had previously. All these instruments are detailed below. The next thing we tackled were the performers. Unfortunately, despite the new crisp detail, we were unable to find any new surprises. So time for me to go back and start at the beginning for any new readers…. Back in 2003, the first thing I determined when this photo was submitted was that all thirteen harp guitars pictured were Knutsens. More amazing yet was that the left-handed player looked amazingly like Chris Knutsen himself! Once I spotted Knutsen’s wife Anna - wearing that same distinctive hairdo, pose and expression as in the famous 1900 family photo - I was convinced. And the original photo now gives us one of the best images of Chris Knutsen to date. Chris Knutsen in 1902. There is a tiny bit of photo wear. This has probably not been removed from the frame since 1902. We were unable to identify any other players (including any of the Knutsen children), and in fact, only recently figured out who Payne was (again, thanks to additional information and images [below] from Paul Ruppa). I’ll continue on now with the originally posted story and then add some new discussion and information on Payne, the school’s founder, and speculate a bit more on the instruments and relationships. 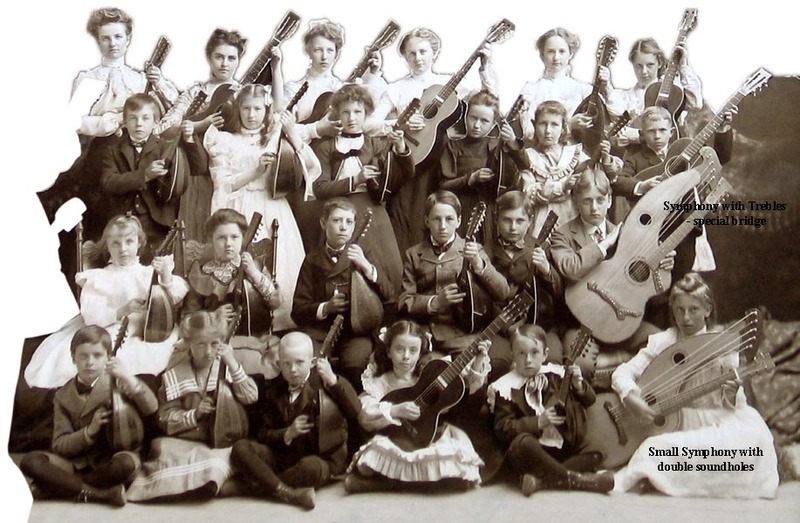 The accompanying portrait shows the members of Payne's Mandolin and Guitar School, who furnished the musical program at the Spokane Theatre, June 17. The reports by the local papers bring out the facts that the entertainment was unique and excellent in character, scoring a decided hit. The Spokesman Review says: "The theatre was crowded to overflowing and the audience was not disappointed. The overture was played by 75 mandolins, guitars and harps, seated in a forest scene on a special staging elevated in the form of a pyramid. Men, women and children, alike, were dressed in pure white and when the curtain arose a dim green light thrown over the scene gave a hallowed effect. The director gave the signal and every instrument was sounded simultaneously in one grand chord at the same instant, like a flash of lightning, all was under the glow of a brilliant white light. And the lights continued to change through all the colors of the rainbow in sympathy with each movement of shading and harmony, thus illustrating the idea of harmonizing color and sound. 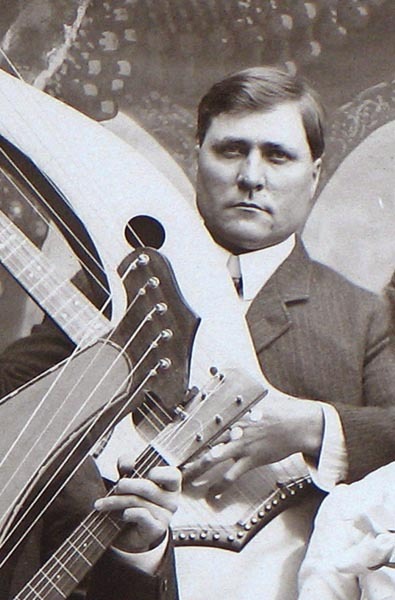 Another feature which created much enthusiasm was the use of the mandocello as a solo instrument in the serenade "El Caballero," one of C. E. Pomeroy's best compositions. The accompaniment was played by 2nd mandolin and guitar. We believe the performer, Mr. H. Louis Schermerhorn, has the honor of being the first to appear as soloist on this beautiful instrument and the manner in which he handles it is most remarkable and the musical effects are superb. Mr. Schermerhorn is a pupil of Payne's Mandolin and Guitar School and uses the new upright position of holding the instrument. Note that Knutsen is not mentioned, nor his unique instruments (the writer’s term “harps” probably a syntax error referring to the single harp). Of great interest to us is Knutsen’s role in the group – both his musical role and that of his instruments. Was he a student or a teacher? 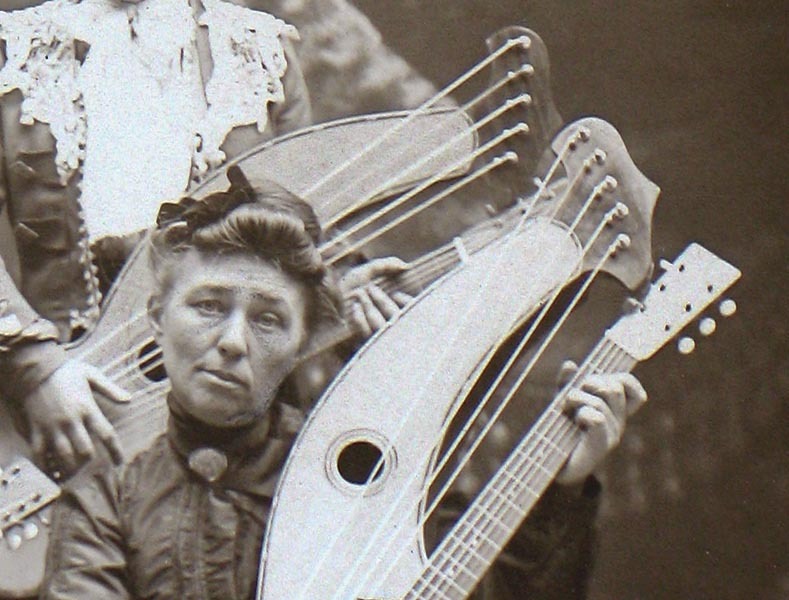 What were ten or more brand new harp guitars doing in the group? Was he simply being altruistic - offering his instruments to the group’s members on loan, perhaps with "option-to-buy" or other payment terms? Or was this, as Darrell Urbien suggests, an attempt at a new distribution deal for both Knutsen and Payne? Coincidentally, Knutsen’s distribution deal with Dyer (“in all states except Washington and California”) likely ended in 1902, when Dyer licensed the design and formed a new association with the Larson brothers in Chicago. So the time frame fits. 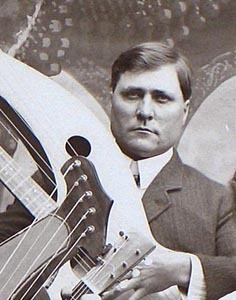 Additionally, Payne was familiar with the harp guitar, having used a Washburn version in more than one ensemble (see below). More importantly, we think Payne must have had an arrangement with the Jenkins company promoting the “Harwood” guitars and mandolins in his many groups (further details below). In fact, other than the Knutsens and one unique Waldo mando-cello, the instruments appear to be almost exclusively Harwood brand instruments (the bone rectangle fret or headstock marker – engraved “Harwood” - gives them away. They are believed to be the only instruments with this feature at the turn of the previous century). Doing exhaustive analysis of the instruments, including the many duplication possibilities of the four quadrants, Darrell Urbien counted a minimum of 21 Harwood instruments. Payne is clearly still promoting the Harwood brand – is he adding Knutsen to his supplier list? There is no way to know, but this single photo strongly hints at something more than a casual get together. As regards the specific Cadenza photo and Spokane concert review, more problematic are the logistics governed by simple geography. It appears that the pieced-together studio photo was taken in Seattle (details below). As Knutsen researcher Jean Findlay points out: “Spokane is 290 miles east of Seattle, a good day’s train journey away. But [at the time of the concert] Chris was living in Tacoma. Presumably, the “75 performers” were (mostly) those pictured in the unrelated studio composite shot. The questions are: Who paid for train tickets and accommodations for the 75 members?! And were Chris and the harp guitars even present?” Very good points, indeed! Payne was born in California in 1867. He is leading mandolin clubs in Redlands, CA as early as 1892, and again in 1898. He also led a group of mandolinists in the Salvation Army (is it a coincidence that the Knutsen/Payne photo was discovered in a Salvation Army store?). 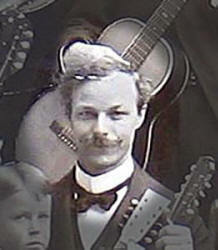 He also led various mandolin and guitar clubs in Los Angeles in the 1890s. Some of these were “Harwood Guitar and Mandolin” clubs, where Payne was likely promoting the Harwood brand instruments to group members and his students. Sometime before May, 1897, he left Los Angeles to live in Phoenix, Arizona, moving back by March, 1898. In 1899, he established the Payne School, likely in Seattle. In 1900, he is living in Seattle, at 805 Madrona St. He was married in 1898 (wife’s name Jennie or Janie), and his occupation is “music teacher.” Note that Seattle is where the Knutsen/Payne photography session took place. By 1910, he has relocated to Spokane (209 Post St). Note that Spokane is where the Cadenza-reviewed concert took place. It is thus possible that he was already living there when the concert took place. He is still a music teacher, now with his own studio. In the census, he is reporting his age younger by three years. By 1920 he is out of the music business and back in California in Los Angeles (though a 1920 college directory still lists “Payne’s Mandolin and Guitar School, Lester Payne, Principal” in Spokane). He moves through several occupations until his death in 1944. The occupations include: Milling company salesman, reed dealer, food manufacturer, chicken farmer (“poultry expert “), and finally, four more years as a musician, then four years of retirement. According to a May, 1900 issue of The Cadenza, "Mr. Payne is one of the most prominent teachers of the West, and a performer of ability. He has successfully organized and drilled several excellent orchestras of mandolin, guitar and banjo players that have gained quite a reputation on the Pacific coast. 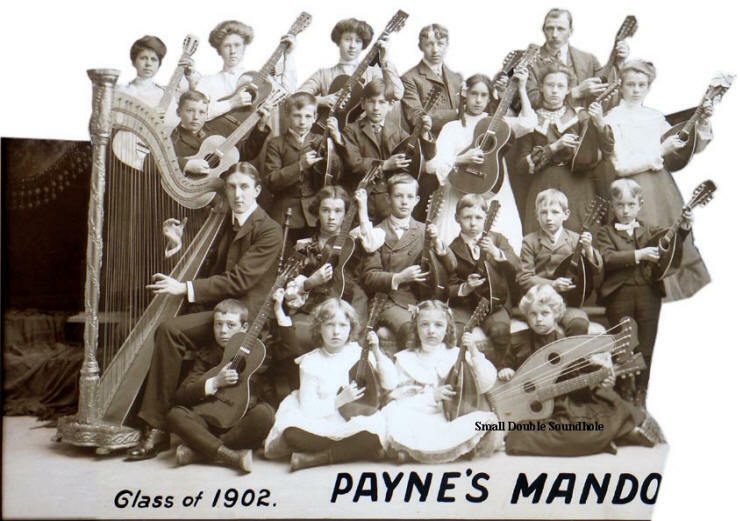 Mr. Payne’s name in connection with any club or orchestra is a guarantee of its merit, and the The Cadenza Mandolin Orchestra has made such a fine showing and such rapid progress that it may be classed as among the very best with which Mr. Payne has been identified. The success of the Orchestra is fully deserved, and we extend our best wishes for the long life and prosperity of the director and members." 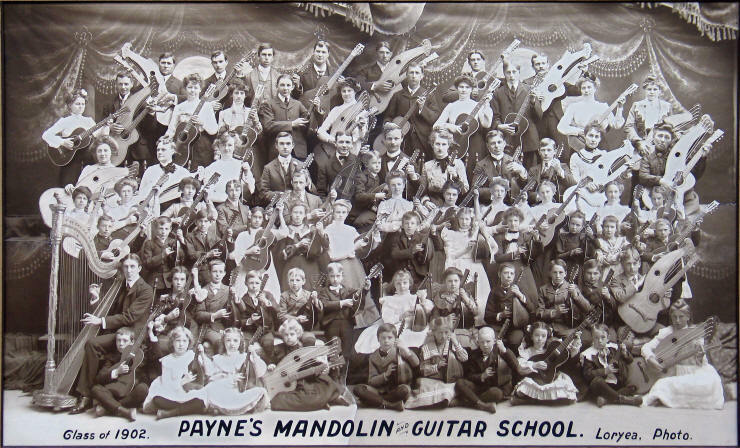 So it seems Payne's forte for at least a decade was as a roving independent organizer of mandolin and guitar groups. He would play with the group, likely provide instruction the musicians as needed, and share his experience and repertoire (including his own compositions). He was in an obvious position to also help with procuring suitable instruments, so a relationship with a manufacturer or distributor such as the Jenkins company was only natural. At some time in 1896, Payne was photographed with a Harwood Club in Los Angeles. 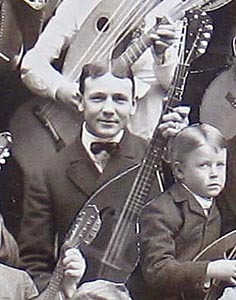 Note the Lyon & Healy-built “Washburn Lyre Guitar.” Unlike the catalog listing and the two surviving specimens, this is the even rarer harp guitar version, with three sub-bass strings. Note that Payne does not yet wear his distinctive moustache. 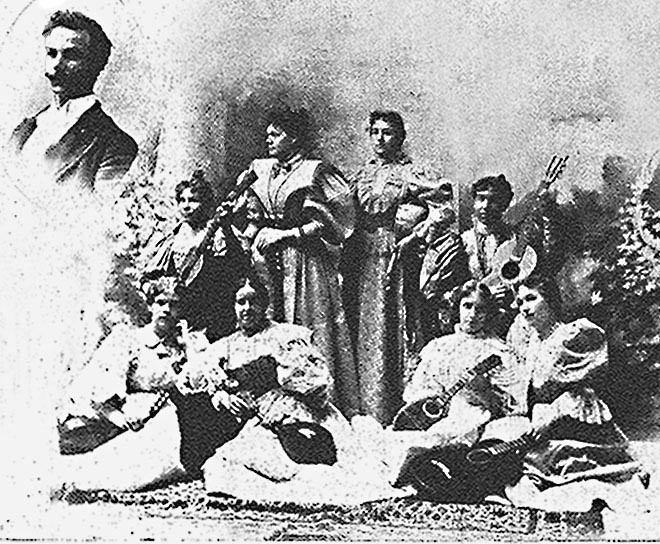 Ladies Manzanita Mandolin Club of Prescott, Arizona, 1897 Next, according to The Cadenza, Payne moved to Phoenix, Arizona (by 1897), where he continued his grooming and start-up of new mandolin clubs. 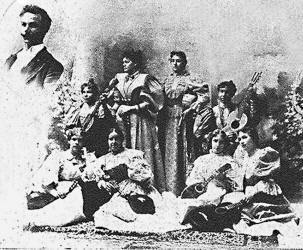 Here his picture accompanies the Ladies Manzanita Mandolin Club of Prescott, Arizona, as seen in the May, 1897 issue of The Cadenza. The Cadenza goes on to report that Payne was now establishing himself in Los Angeles (by March, 1898) - and yet entries in the online International Guitar Research Archives list two pieces of music (written by F. O. Gutman) that were performed by “the Harwood Guitar and Mandolin Club, Los Angeles, Cal., Lester Payne, Director.” The years are 1894 and 1896. As he was born in California, and leading groups in Redlands by 1892, it would seem he had already enjoyed several years of success there. Presumably Payne was importing Harwood instruments from the Jenkins company in Kansas City, Missouri (we still don’t know who built the Harwoods for Jenkins, nor where – “New York” is usually stamped inside). In (or around) 1899, Payne moved to Seattle, where we presume this studio portrait was taken (at left), discovered on a piece of 1901 sheet music by Paul Ruppa. Paul noticed the painted curtain backdrop – this is the exact same studio where the four shots of the Knutsen-laden group would be taken a year later (!). 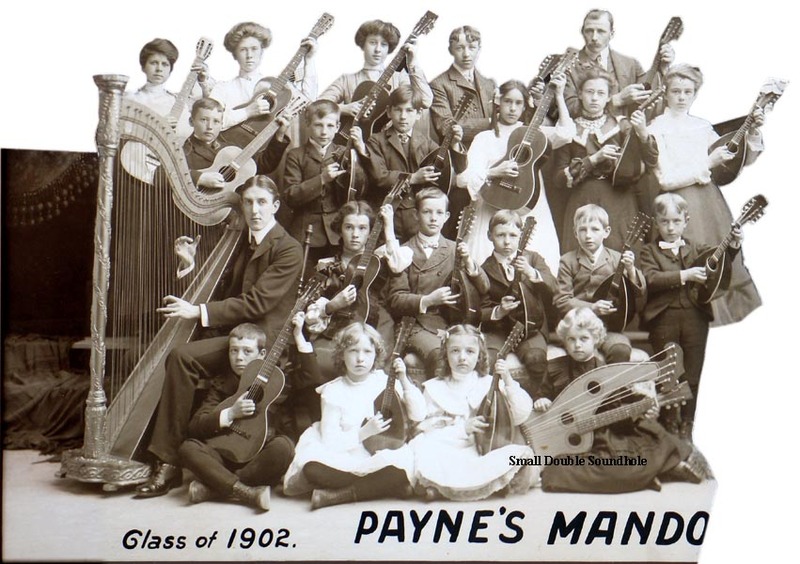 It appears that Payne owned (or brought with him) the Washburn lyre-harp guitar, as a new female member is now playing it. 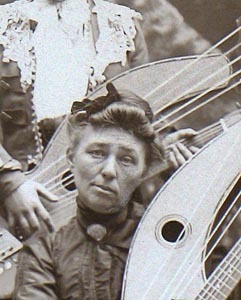 Paul spotted the woman (now with a Knutsen), along with additional members – including the mandocello soloist, plus Payne himself - in the 1902 photo. We believe that these are brand new or near new instruments built within a roughly six-month period around the beginning of 1902. 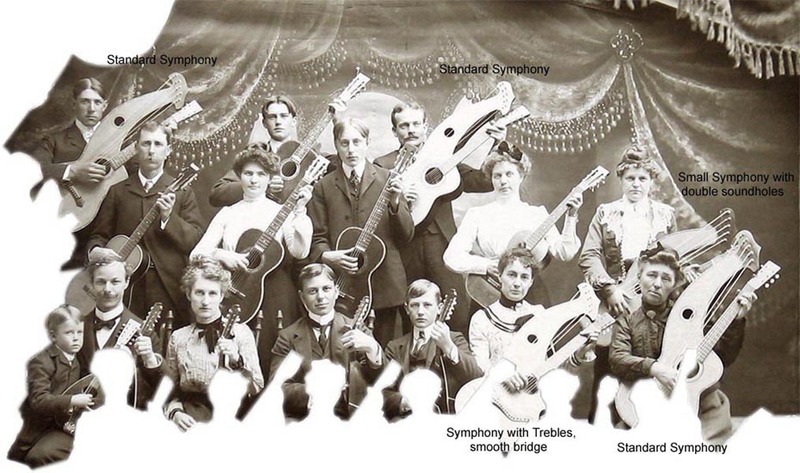 Note that all have solid headstocks and geared tuners. This matches exactly how the specimens have fallen into place in the dating scheme postulated by Noe and Most and continually fine-tuned in the Knutsen Archives (solid headstocks started as early as 1898 but were extremely rare, and originally had friction tuners. More common were “slotted” headstocks – actually six individual crudely beveled holes – with side-mounted classical-style geared tuners). Some of the instruments also have the slanted frets – specifically mentioned in the labels we have previously circa dated at 1900-1902. The bass headstocks demonstrate a slight “evolution” – again, matching the instruments we have circa dated to the 1900-1902 period. These are the last of the “standard Symphony” bass headstock shapes – none have what I have labeled the “Evolving Symphony” shape, nor do any have the new “ES” bridge. Overall, they show a remarkable consistency (for Knutsen), but still feature plenty of creativity (double soundholes, treble strings with different bridges) with a noticeable variation in “short-term evolution” bass headstock shape. As usual, Knutsen’s hand-built techniques without standard trim or inlay enable us to differentiate nearly every specimen - so let’s start hunting! We’ve already pointed out Lester Payne, on mandolin. The remaining player and instrument of note – as mentioned in the Cadenza article - is soloist Louis Schermerhorn. He is holding a rare Waldo mando-cello, a historically important instrument that preceded Gibson's better known mandolin orchestra instruments. The following tables (for Knutsen geeks only) show each of the 13 visible harp guitars, explaining the features that enable us to identify 2 as repeats, and 1 other as a possible repeat, giving a total of 10 to 11 distinct instruments. Of the ten, even though we can show them to be different from each other, we cannot be sure that some of the more standard ones aren’t already in the Archives. We can show six as unique – three of which I had already placed in the Archives, the three others now added also. Our working code numbers for the Payne photo are Quadrant (UL), then Row (R3 is back row), then harp guitar counting from the left (1, 2, etc.). UL-R1-2 UL-R2-1 is NOT either of the 3 in the next quadrant. Dot inlays, tuners staggered higher on left, frets slanted or straight? Straight frets, tuners unknown Fancy inlays, straight frets, tuners uniform or barely staggered lower on left Also fancy inlays? Fancy inlays, uniform tuner position Dot inlays, tuners stagger higher on left, a string goes across top 2 tuners Note string across top, staggered tuners, dot (?) inlays, bass headstock color/grain - even though soundholes are hidden, this is LR-R1-1 An obvious double-hole -which one? For my complete write-up of Lester Payne, don't miss my blog of 2013. All Site Contents Copyright © Gregg Miner, 2002, 2003, 2004, 2005,2006,2007,2008,2009,2010,2011,2012,2013,2014,2015,2016. All Rights Reserved.